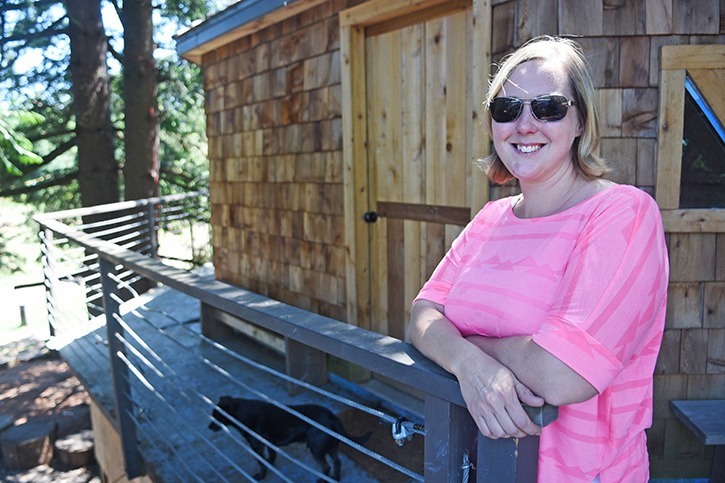 Cathy Finley stands on the deck of a reclaimed tree house she and her husband, Ian, built on their property, Laurica Farms. On Sept. 11, the Finley’s will co-host the 22nd annual Metro Vancouver Feast of Fields. When Ian and Cathy Finley first moved to Canada from England in 2009, they were excited to raise their two daughters in the new Clayton Heights subdivision of Surrey, and progress their careers in both construction, for Ian, and social work, for Cathy. Despite meeting many new friends and getting “immersed in Canadian culture” in that neighbourhood, the suburban sprawl was “too claustrophobic for us,” Cathy said. “It was too high density … even when you have row houses in England, you’ve still got space, you’re not looking into each other’s windows and things like that. We moved to Clayton Heights and I thought, ‘I can see into seven different people’s houses from my back door,’” she said. By here, she means a quaint five-acre plot of land, located just off 256 Street at the end of 12 Avenue, where the road narrows to just one lane, and large trees hang across on either side. They named their property Laurica Farm — after daughters Lauren and Jessica — and in three years have transformed it from a home in the country, to a viable business in B.C.’s emerging permaculture industry. For Cathy, who admits she has only had one day off in the last 365 days, providing good, wholesome food to the community has become a passion. “We were feeling just a bit disenchanted with the food industry,” Cathy explained. In her first year of farming, Cathy decided to take some of her organic salads and eggs back to her old neighbours in Surrey, which quickly snowballed into a delivery route with 20 families per week. From there, she started going to local farmer’s markets, and hosting a couple of events at the farm, which leads up to today — year three — where Laurica now has a spot on the Circle Farm Tour, weekly farm gate sales, special events and a market every weekend during the summer, and even a petting zoo, complete with goats, ducks, chickens and “Rosie” the pot-belly pig. “It’s gone crazy,” Cathy said. On Sept. 11, the Finley’s will host one of their largest events yet. The 22nd annual Metro Vancouver Feast of Fields is setting up on the Laurica property and neighbouring Fraser Common Farm next door. As the oldest local food festival in B.C., the four-hour event gives both city folk, and country folk alike the opportunity to get up close and personal with their food producers. Armed with a “wine glass and linen napkin in hand,” more than 1,000 guests will wander from tent to tent through the beautiful farms to taste creations from some of B.C.’s top chefs. With all food sourced locally, the event highlights the province’s small-scale producers, while raising money for the non-profit society FarmFolk CityFolk, whose mission is to create a local, sustainable food system in B.C. Not only will Feast of Fields bring many new farm fresh foodies to the Finley’s farm, but the event also embodies the sustainability vision Ian and Cathy are trying to create. “We talk about symbiotic farming, everything relies on one another. There’s not one thing here that is here just for its own good, apart from maybe Rosie,” Cathy laughed. Their pigs, for example, were purchased to help the topsoil, which was removed 40 years ago when the property was quarried. “We figured out that we could either buy and ship the soil in, but again, the sustainability aspect of it, that didn’t make sense to me,” Cathy said. The pigs till the fields, the chickens aerate the soil, the goats control the weeds, and the ducks, who eat the bugs and slugs, are natural insecticides. All of their animals are also “heritage breeds,” meaning they are free from genetic modifications. Cathy’s rare pig breeds even attracted actress Isabella Rossellini to visit from New York. “I think somewhere in the middle we’ve forgotten how to farm,” Cathy said. Make no mistake, starting a farm from scratch hasn’t been easy, especially since neither Ian nor Cathy have a background in agriculture. They have had to “pound the pavement” to get their Laurica name out in the public, and come up with creative solutions to stay true to their sustainable mandate. “It was a bit overwhelming,” Cathy admitted. “I thought I was well informed, but until you actually immerse yourself in the lifestyle, you can’t know. Farming, or farm-life, is not something you can learn in university. You can learn the theory and stuff, but actually living it is way different. And really, for us, it was never a plan that we’re going to have goats, and pigs and chickens, and this and this, it just happened step by step,” she said. With many lessons learned, the Finley’s now want to pass that knowledge on to others, which is why they are doing everything they can to lure more and more people out to their farm. They have built a secret fairy garden for children to explore, a reclaimed tree house where long table dinners and yoga classes are held, and frequently host tours and summer camps for youth. “I think if people start coming to farms and enjoying being at farms and eating the food, seeing chefs produce great food from their area, it’s massive,” Cathy said. But the reality is, successful small farming is difficult to achieve and is full of bureaucracy, Cathy said. There are many restrictions put in place by the Agricultural Land Commission and other industry changes, such as some chicken processors eliminating small flock orders. “I think the potential reach of good small farms is huge, but we’re stumbling over these blocks all the time,” Cathy said. “You solve one issue and another comes in. I just want to grow food, I just want people to eat well, I just want people to stop eating factory meat, I just want people to care about the Earth. That’s our agenda. We’re never going to get rich farming — ever — we know that. Despite the road blocks, long hours, and even occasional animal rights protests at their gate, Cathy says she wouldn’t go back to her suburban life. “It is a constant lifestyle everyday. It’s very full-on all of the time, especially in the summer. We get up and work early, then kind of siesta, if you like, during the afternoon when it’s too hot, and start again in the evening. But the rewards are — it’s not anything I can articulate well. The rewards are the lifestyle. Laurica Farm is open to the public on Saturdays from 10 a.m. to 2 p.m. For more information on tours and weekend events, visit www.lauricafarm.com. Tickets for Feast of Fields are $95 and are available online at www.feastoffields.com/metro-vancouver. The event takes place from 1-5 p.m. at 25775 12 Ave. The “Farmacy” at Laurica Farm contains edible flowers and herbs, and is all part of Ian and Cathy Finley’s commitment to natural, sustainable food.